The spiritual healing offered by Christian Science is available to everyone. God is "a very present help in trouble", and our services hope to lead you into the spiritual understanding that makes this help a reality for you. There is never any pressure on you to become a Church member - you decide on how much you join in. In Christian Science, we study to gain an understanding of God as the essence of our being. 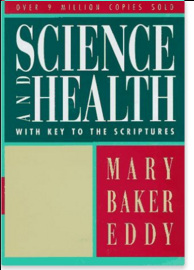 There is a wealth of resources in the Reading Room - Bibles, study aids, magazines, and also the book by Mary Baker Eddy, called "Science and Health with Key to the Scriptures" which has given to many people a sense of well-being, completeness and happiness unlike anything they ever expected. There are on-line and digital audio products as well, and Christian gift ideas for children. Plus collections of poems to help uplift the thought of a friend or neighbour.